The Endless Journey limited bank storage has been published to all shards. As stated earlier we will be making additional changes in the near future to complete the system. All but 2 of the winners of the Human/Gargoyle houses in Ter Mur have been claimed and I would once again like to congratulate those winners. Below is a list of the actions and the numbers of people we have banned since the first of April. Bundor had nearly finished editing a retrospective on the Time Between Crowns, when Lady Machiavelli recalled into his office. She unceremoniously dropped a bag of mismatched pages on his desk. “A brief summary of the Governors’ Meeting, the Yew farm report, an interview with a goblin, and my letter of resignation. As Lady Machiavelli wandered off to finish her late breakfast, Bundor looked at the pile of edits before him. These were interesting times. Smiling, he pulled out a fresh quill and started a new piece, The Endless Journey. We would like to update you on storage options that will become available for Endless Journey accounts. All Endless Journey accounts will have access to their bank box providing a reduced amount of secure storage. Former Veteran accounts that return as Endless Journey accounts that have more items than the reduced limit allows will be able to view the contents of the bank, but will not be able to remove any items at this time. We are working on ways to provide access to these items and will update you as these options become available. We hope to have these changes live on Test Center sometime next week, and deployed World Wide as soon as testing permits. Remember you can gain access to all the items in your bank by subscribing at any time. Endless Journey has brought a new era to Ultima Online and we appreciate your continued patience and feedback while we fine tune the experience to best meet everyone’s needs. 冒険者: the mascinet was drop? ・Can be used once per week to obtain a partially hueable artificial plant that matches plants available through the gardening system. ・Must be locked down or secured to use. ・Can only be used by veteran accounts. ・Can by dyed with natural dyes. ・Chance at receiving 1 of 8 rare hued plants. Can be used once per week to obtain a partially hueable artificial plant that matches plants available through the gardening system. The Moonglow Zoo will temporarily cease accepting donations while we resolve an issue. The Zoo will begin accepting donations following each shard’s normal maintenance. Publish 99 has been deployed World Wide, introducing a host of new features – most notably Endless Journey! The transition for closed accounts to Endless Journey accounts has begun and will continue until all accounts have been processed. We appreciate your patience as we work through this process. You will not be able to login until the account has been processed. Update 4/5/2018 6:00pm ET: The account transition process is continuing. Based on current processing rates we expect this process to take as long as the next 48 hours to complete. We will update this post when the process has fully completed. Thank you for your continued patience while we work through this process. We look forward to your feedback, and welcome new and returning players back to Britannia! Be sure to check out the forums for the latest conversation on all things Ultima Online. The raffle stones for the Human & Gargoyle Abyss houses that have been available on select shards will be removed today. We will be announcing the winners on Monday! Good luck! Please also note that Vendor Search on Origin, Izumo & Baja will not populate properly until vendor owners opt-in/opt-out or those shards go through their next regularly scheduled maintenance. UO公式　Spring Has Sprung! A Special Gift For You! Spring Has Sprung! A Special Gift For You! 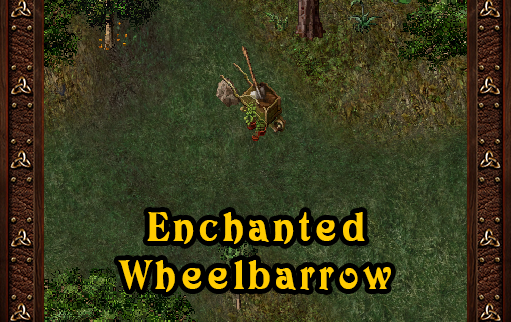 To celebrate the dawn of the season of rebirth an “Enchanted Wheelbarrow” can be claimed on all shards after 2pm ET on April 5, 2018 by veteran accounts for the next 5 days by visiting the Britain Commons and using the genie statue. Enjoy! The genie statues will be placed manually, so please allow some time for placement before visiting the commons. Happy Spring! For over 20 years Ultima Online has given thousands the ability to live in a world born of mystic arts and ancient sorcery. Endless Journey will allow players past and present to return to Britannia and rekindle the magic of this venerable MMO! Ultima Online: Endless Journey is a way for players to experience the core features ofUltima Online without a paid subscription. Endless Journey accounts will have access to all pre-existing and newly created characters on all shards. Who is eligible for Endless Journey? New accounts and previously paid subscription (veteran) accounts that have been closed for at least 120 days are eligible for Endless Journey. What do I get with Endless Journey? accounts receive complimentary access to all Ultima Online expansions through Stygian Abyss. Other expansions can be purchased and applied to an Endless Journey account. Endless Journey accounts have access to the Ultima Online core features and can enjoy exploring Britannia, training character skills, making friendships that will last a lifetime, and much more! What does Endless Journey cost? Endless Journey accounts are free to access. If I’m playing an Endless Journey account can I upgrade to a veteran account at any time? Yes! You may upgrade your Endless Journey account to a full veteran subscription at any time. Can an Endless Journey access the Ultima Store? Yes! The Ultima Store can be used to purchase a variety of helpful and vanity items for use in game with sovereigns purchased from the Origin Store. What are the restrictions on building my character’s skills and stats? None. Characters on an Endless Journey account are eligible for up to the total of 720 skill points and follow the same stat restrictions of a veteran account. Endless Journey accounts may use Scrolls of Alacrity, Power, Stat, and Transcendence. Can I use a character transfer with an Endless Journey account? Yes, character transfer tokens can be used to transfer to all shards where character transfers are eligible. Endless Journey accounts may also character copy and access TC1. What kind of access to storage does an Endless Journey account have? Endless Journey accounts have access to a standard player backpack. What happens to my bank if I am a veteran account and decide to close my account? Can Endless Journey accounts own a house? a house for access to wall safes. Are there other housing related restrictions to Endless Journey? Endless Journey accounts cannot access mailboxes, locked down or secure containers, drop stackable items onto a locked down stack, or place auction safes. Endless Journey accounts cannot safe logout in housing and must use a city inn or tavern. Can Endless Journey accounts access Vendor Search and interact with player vendors and auction safes? Yes, Endless Journey accounts can access Vendor Search and freely purchase items from vendors and auction safes. However they may not place regular and rental vendors or auction safes. Can Endless Journey accounts collect IDOC loot? Endless Journey accounts are not able to pickup IDOC loot until a 30-minute cooldown period has passed. Can Endless Journey accounts access chat? Yes, Endless Journey accounts have access to General Chat and Global Direct Messaging. Can Endless Journey accounts participate in Champ Spawns? Endless Journey can use Valor to start champion spawns and acquire valor while doing spawns but may not receive rewards or scrolls from Champions. Can Endless Journey accounts participate in Vice vs Virtue and Player vs Player combat? protected by another player via the Justice Virtue. Can Endless Journey accounts access dungeons, the Stygian Abyss, and the Valley of Eodon? the Valley of Eodon if they have purchased the Time of Legends expansion. Are there restrictions on accessing expansions, boosters, and theme packs? Endless Journey accounts include access to all content up to Mondain’s Legacy and Stygian Abyss. Access to High Seas, The Gothic & Rustic Theme Packs, The King’s Collection, and Time of Legends is available if purchased. Are Endless Journey accounts eligible for veteran, promotional, holiday and Event Moderator rewards? Endless Journey accounts may not claim veteran rewards and will not gain time towards veteran status, however they may use otherwise claimed and obtained veteran rewards. Endless Journey accounts may not claim promotional, holiday, or Event Moderator rewards and cannot attack Event Moderator creatures. Can an Endless Journey account harvest resources from the world? Endless Journey accounts may only harvest basic resources such as iron ore and regular lumbar and are not eligible for double resource bonuses in Felucca. Endless Journey accounts may use pack animals to assist in their harvesting efforts and can receive Mondain’s Legacy resource rewards. Endless Journey accounts can use commodity deeds via the deluxe vault. Can an Endless Journey account use the Pet Summoning Ball, Bracelet of Binding, and Bag or Chest of Sending? Endless Journey accounts may use the Pet Summoning Ball and Bracelet of Binding, but may not use the Bag or Chest of Sending. Can Endless Journey accounts board and place ships? Endless Journey accounts may board regular and if purchased, High Seas ships. Endless Journey accounts may not place a ship. realm known as Ter Mur, and a new dungeon named Stygian Abyss. This dungeon is the largest in Ultima Online to date, with new monsters, tricks, and treasures. Ultima Online Stygian Abyss includes three new skills, pets, craftables, items and housing design tiles. The Account Center will be down Wednesday, April 4, 2018 at 10am ET for updates. We expect this downtime to last approximately 2 hours. This is in addition to scheduled downtime on Thursday while we have the shards down publishing Endless Journey. Please note this does not mean Endless Journey will be activate on Wednesday. Endless Journey will not be active until Publish 99 is deployed world wide. I would also like to take this time to warn everyone that we will be actioning accounts that are caught scripting and/or multiboxing. We are not going to be giving out any warnings for this if you are caught. We are also going to be posting monthly the number of accounts that were actioned due to illegal program use, macroing, or harassment/disruptive behavior. Thank you in advance for your patience with us while we get the Account Center and the shards updated tomorrow and Thursday. Origin, Izumo & Baja will be brought down by 11:00am ET on April 3, 2018 for an update to Publish 99. Please see the publish notes for the latest updates. We anticipate Publish 99 will be going World Wide on April 5, 2018. This update will be done manually, and not during regularly scheduled maintenance. Regularly scheduled maintenance for all shards will be cancelled beginning on April 5th and will resume on April 6th. Shut messages will commence at 10:00am ET and shards will be brought down at 10:30am ET. We anticipate the downtime will last approximately 3 hours. Keep an eye on UO.com for updates on publish status. Beginning at 10am on April 5, 2018 the Account Center will be brought down in preparation for Publish 99. The account center will return at the time Publish 99 is released world wide. Please also note that when Publish 99 goes World Wide the rewards available from the 20th Anniversary Elemental Titan arc will no longer be available to claim.